I absolutely love this collection of stories. It was so good and nice to understand Magnus Bane's point of view. I absolutely loved the voicemail story at the end of the book. The fact that everyone was so keen on getting to Magnus and getting him to make up with Alec was beautiful. In general, though, I just love Magnus and it was so nice to see things from a non-Shadowhunter point of view. 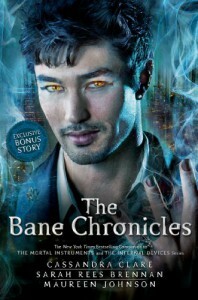 I love The Mortal Instruments series, but the reason why The Infernal Devices and now The Bane Chronicles are my absolute favorites is because they take into consideration the viewpoint of the people who are marginalized by the majority. I want stories from each Downworlder perspective, to be honest. I think it's refreshing and fascinating and shows more of a complete magical world then one that solely focuses on Shadowhunters.